We love our lemon thyme plant. Every time when we are relaxing at our balcony, my son will pick a few of our lemon thyme, crush the leaves, rub them on his hands and then smell his hands with lots of deep breath. "Mummy, do you want to smell my hands?" He will then ask me to smell the leaves with him and I will. Indeed, I think lemon thyme did smell a little like lemon and we both loves the fragrance of lemon and these lemon thyme leaves. This recipe from the MasterChef Magazine, July 2011 issue is quite unique; it uses lemon thyme to enhance the taste of a frittata. Good that this magazine is free, but only for this issue from its app download. 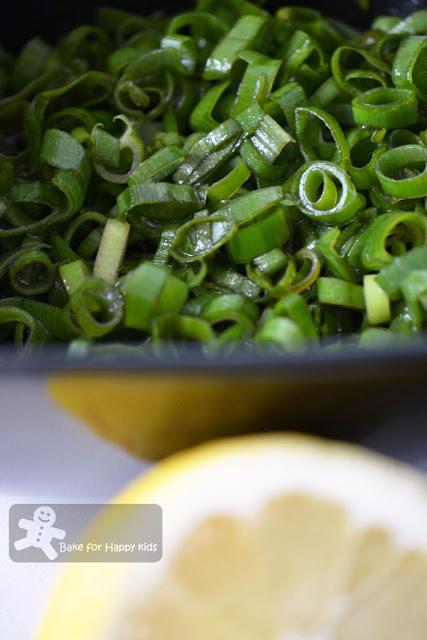 When I buy a bunch of spring onions or leeks, they usually come in a bundle of 8-10 and the frustration bit is that I need only 2 of each in this recipe! To minimise wastage, I have decided to replace leek with the the white parts of spring onion. I didn't want to waste extra money again, buying flat-leaf parsley and so I replaced them with baby spinach which is part of our salad for the day. Plus, another ingredient in this recipe, the white balsamic vinegar is not easily available in any local stores and supermarkets and so it is not available at the time when I cook this dish. I reckon...trying to cook like a MasterChef is really not easy and very money consuming. I think I'm more like a thrifty mum in this case. LOL! To make spring onion dressing, process all the ingredients in a food processor until combined. Season with salt and pepper. Preheat oven to 200°C. Melt half the butter in a 24 cm (mine is 26 cm) oven proof frying pan over medium heat. Add leeks (white spring onion) and garlic, and cook stirring occasionally for 10 min or until leeks (white spring onion) are soft. Meanwhile, melt remaining butter in a large frying pan over medium-high heat. Add thyme and potatoes, and cook, turning for 5 min or until golden. Using a slotted spoon, remove potatoes and drain on paper towel. Add half the potatoes (I added all from 1 potato) to the leek (white spring onion) mixture and season. Place parsley (I didn't add this), Parmesan and eggs in a bowl and whisk to combine. Pour egg mixture over leek (white spring onion) mixture and stir gently to combine. Transfer the pan to the oven and bake for 15 min or until frittata is firm but slightly wobbly in the center (it will continue to cook). Scatter with reserved potatoes (I didn't have any reserved potatoes) and rocket (baby spinach), if using. Drizzle with a little spring onion dressing and serve with remaining dressing on salad or char-grilled vegetables, if using. Your frittata looks delicious! I think being an Asian, we are not used to so much butter in our food, I always sub with canola oil! The event sounds VERY INTERESTING!! Count me in! Will go search for Donna Hay's recipes, do not have any of her books YET!! So exciting! Thanks Joyce for being so supportive! Oh I love thyme herb, love its citrus flavour, they just combine so great with the lemon. Oh, boy, your frittata sounds amazing! And as I've never made a Donna Hay recipe, I'm very excited for your blog hop. Hope I can join you! Hi Lizzy, You are very welcome to join this blog hop. I look forward to see your Donna Hay's dish. This frittata sounds so delicious and makes me excited for summer in the states! I also love lemon thyme. I'm trying not to be jealous of that lemon thyme. My plant never did grow. Not sure what happened to it, but it was tragic. Oh well, I'll just have to plant another one this year! This sounds delicious! Lovely pics, Zoe! And the frittata looks great! A great idea for a blog hop. Hopefully I can recreate some Donna Hay dishes and join in. Thanks Ping! I look forward to have you blog hopping with me with DH recipes. Hi Zoe! You are an amazing baker and cook. Everything that you have made on this blog so far looks amazing and I'm sure everything tastes as good as it looks. I am like you learning as I create one dish at a time. I have tried so many new dishes and some have turned out wonderfully and others not so much! But each new recipe is like a challenge and when you succeed, you really succeed. Thanks Lena for being so supportive. Very honoured to have Joyce and you as my baking friends. This frittata looks delicious! I love lemon in any dish and I think I d love this one! I too love lemon thyme. This looks wonderful. Such beautiful photos! id love to join in the blog hop! have recently subscribed to the DH magazine so have HEAPS (i mean seriously a stack) of her recipes i want to try :D does that mean 1st March is the day of the post? I have been telling my husband that I would like to cook ourselves a nice frittata on one weekend but I haven't really taken any action so far, haha!Your frittata looks certainly delicious! I had been using Donna Hay's recipes in my Dec's cooking & in fact, there are few more that I want to try out & if I'm not lazy, I think I'll participate in your blog hop! Thanks for organising! My kids would love this. Beautiful flavors. Very interesting blog.Ciao! What great and aromatic frittata!Congrats,dear!Kisses! I love lemon thyme too, but it's hard to get over here. And the blog hop sounds interesting - esp since it's donna hay, who produces one of my fave magazines around! Glad that you like the chosen theme, DH. Hope to have you blog hop with me. Mouthwatering here, wat a terrific and super tempting flavourful frittata.. 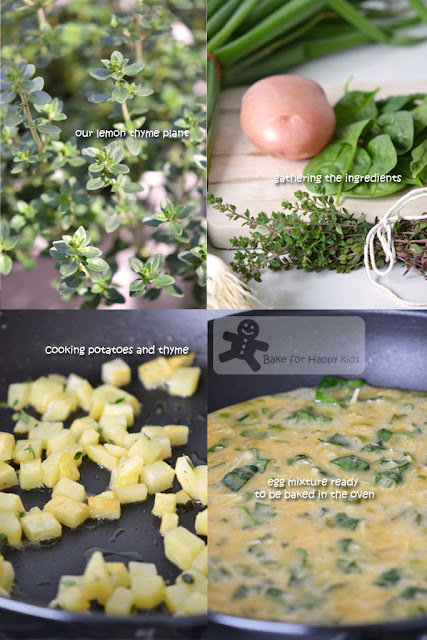 I love frittata,is easy and simple this version sound Yummy !! Just the recipe I am looking for to use the lemon thyme I have! Will give this a try soon! I do have a Donna Hay book somewhere! Hi Zoe, your frittata looks very good. Beautiful presentation and nice picture. Good luck with the "Cook like a star"! I'm also inspired by Donna Hay when I first started to learn baking! this uses all of my favorite flavors- I'm sure I would love it! Very nice combo! I always love frittata! It can be served as a meal on its own and adding potatoes is definitely making it more hearty. ;) Yums! Will be making this Sunday morning; thank you for sharing. Pinning this one. Hi Zoe, I've never eaten a fritata. Yours looks yummy and tempting. Maybe I should make some since my thyme is growing rather well. Lemon and thyme and such beautiful flavours. Never seen them in a frittata before but sounds delicious! What a lovely frittata! Looking forward to reading the results of the blog hop. I could go for some of this frittata right now! Sounds like a fun blog event coming up! mmm this looks fabulous! i am experimenting lately with gluten free foods, and this fits the bill perfectly. can't wait to try it! Oh this is more than yum! 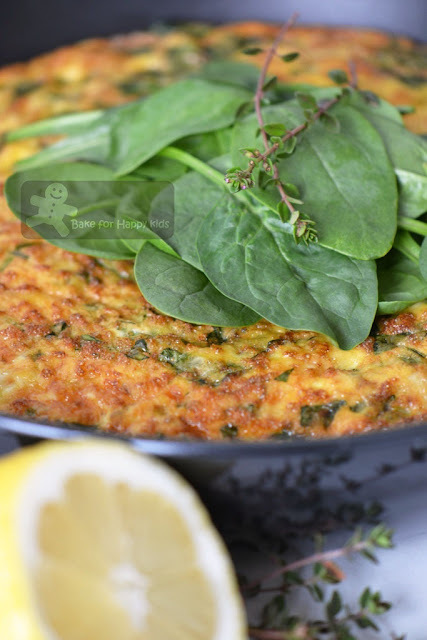 Great looking frittata and what an amazing recipe! Delicious and pretty! That a nice looking frittata, thank you for this great recipe. I on the other hand am crazy for butter in savoury dishes, LOL. This looks delish! And your lemon thyme looks so healthy, mine looks half dead. BTW, spring onions can be kept for a good period of time, provided it is cleaned, and kept in a plastic container. It is a staple in my fridge and it an be kept for a week, minimum. Une frittata bien délicieuse. J'aime beaucoup. I love the look of your frittata. I read from Lena about your event, sounds fun. I'll see if I have time to whip up something from Donna Hay's recipe.